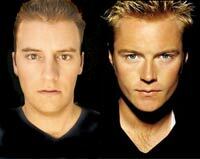 Someone text messaged my phone at 2:00am this morning to tell me that I look like Ronan Keating, former member of the Irish boy band 'Boyzone'. Folks as you can clearly tell from the picture to the left, we are brothers. I am the one on the left, yes the left. Anyway, glad I could clear things up.